1. Remove the innards of the duck, reserving the liver and heart. Roughly chop the garlic and peeled onions, and the liver and heart. 2. Stuff the duck with this mixture, add the aromatic herbs, drizzle generously with olive oil and season. 3. Place the duck in a roasting tin. Roast at 180°C for 20 minutes, basting regularly with the cooking juices. 4. 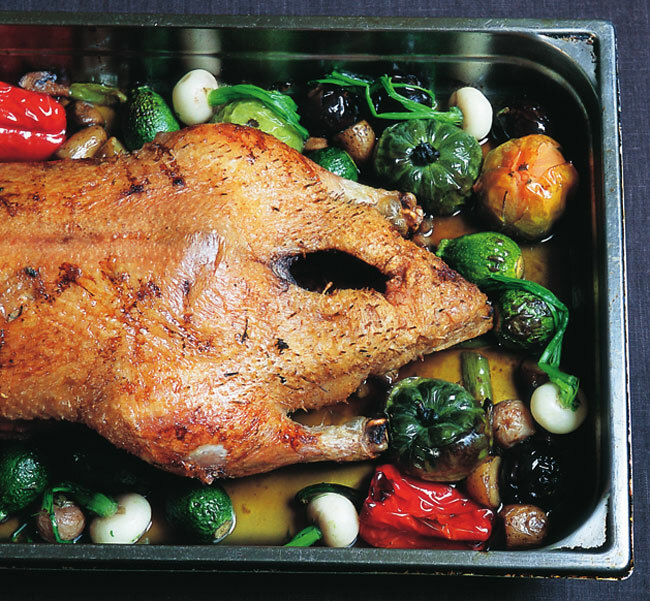 Arrange the vegetables around the duck and season. Cook for a further 20 minutes. Allow the duck to rest for about 15 minutes before serving.